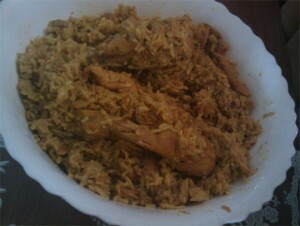 Fish Pulao recipe by Nazia at DesiRecipes.com. Heat oil fry onion golden and add methi leaves, garlic and all masala fry well by sprinkling little water add chopped tomatoes bhuno than add curd, potatoes and fish. Cook for 10 minutes till fish done. Remove fish pieces add whole green chillies and your soaked rice along with 2 cups of water. Cook on high flame till rice cooked and water dries. Lastly put fish pieces on top and put on dam. nice recipe well curd is simple Dahi, but yogurt generally found in some flavours.